Everything that is magnificent and grand, commanding, dominating, truthful, sunny, kingly, awesome (the Sun inspires awe and reverence). The Sun pours its life-giving light on us and, unlike all the other bodies in our solar system, does not have a shadow side. Consequently it has become associated with truth and clarity, goodness and life-giving energy; being awake and alive. The Sun has no dark side. Not that it cannot harm. If you expose yourself for too long or too closely with the Sun you will get burnt. This is reflected astrologically in the concept of combustion and ‘under the sunbeams’, where a planet in close proximity to the Sun is rendered ineffective or invisible because of the Sun’s brightness. However by itself the Sun is life-giving and associated with truth. The Sun is associated with enlightenment because it fills our world with light. It is the source of all light in our solar system and the other bodies can at best only reflect its light. Its light is blinding when view directly. It is the most physical representitive of divinity and the light of truth in our physical universe. The circle of spirit on the outside, with a dot in the centre representing the spark of manifestation or individual ego. From a religious or spiritual perspective the Sun is the natural representative of God or the supreme fundamental power of the universe. While different religions and spiritual groups use alternate words for this ultimate power and intelligence, it is represented by the Sun in astrology. 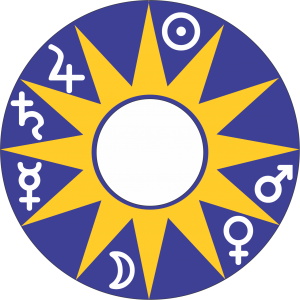 In the study of mundane astrology (politics and wider social movements) or in questions relating to leadership or the exercise of power, the Sun represents the person in charge. Depending on the field of study this can be the king, prime minister, or president of the country; the leader of the gang; the captain of the ship or sporting team; the boss or CEO; the supreme commander of the armed forces; or the president of the local tennis committee. The Sun is the natural ruler of fathers in a day chart. The Sun in the natal chart is the natural ruler of the individual ego or sense of identity which is expressed through the zodiac sign and house placement, as well as other factors such as receptions and aspects with the Moon and other planets. The Sun also represents people associated with the house that has Leo on the cusp. If for example the 6th house has Leo on the cusp the Sun will represent workers or employees, or pets. If Leo is on the cusp of the 3rd house it will represent one’s siblings or neighbours. The Sun rules solar energy, and also nuclear energy because it powers the Sun. The Sun rules the zodiac sign of Leo, and is in detriment in the opposite sign: Aquarius. The Sun is exalted in Aries, and in its fall in the opposite sign: Libra. In the ancient system of the Joys of the Planets, which makes a significant contribution to the underlying structure of the houses, the Sun rejoices in the 9th house. This is a natural fit as the 9th house is associated with spirituality, higher knowledge, and truth. Following the Chaldean order of the houses beginning with the 1st house, the Sun is associated with the 4th house, and is the natural ruler of fathers and the foundations of life. Following this Chaldean order further the Sun also rules the 11th house which is associated with blessings from heaven, lottery wins and good fortune in general. Hot and dry, choleric, diurnal, masculine. Day: Sunday (day of the Sun). A person who is large and strong; has a round, large forehead; large piercing eyes; a body strong and fleshy and well composed, a ruddy complexion; and a healthy constitution. Positive: Big heart, generous, magnanimous, honest, sincere, high-minded, humane, dignified, faithful, punctual, desire to rule, prudent, of incomparable judgement. The solar person has majesty and stateliness, and speaks prudently with gravity and with few words. This is a confident, commanding; thoughtful, and trusty person, who speaks deliberately, is affable, and loves sumptuousness and magnificence. Negative: This person is proud and arrogant, disdainful, and domineering. The tastes are expensive and gaudy. This is the foolish and wasteful spendthrift, who has an undeserved sense of entitlement of the charity and generosity of others. The Sun has dominion over rulers of every classification in humanity and in nature. In the human kingdom this would include kings, presidents, prime ministers, the CEO etc. ; the person in charge; the owner of the company. In the animal kingdom the Sun is represented in any phylum, class, order or family by the top or dominant animal. Examples include the lion and in birds the eagle. Jewellery: Diamonds, hyacinth, chrysolite, ruby. Places of exceptional grandeur. Stately buildings, courts, palaces, halls, dining rooms. The life force. Heart, brain. The eyes in general because of their association with light. In particular the right eye in males and the left eye in females. In palmistry the Sun is represented by the Sun mount at the base of the hand under the thumb and it’s vital energy in this physical life by the Life Line.